Obey all the commands of the Field Captain. Ground layout is vital to ensure safety and the GNAS Rules of Shooting must be observed in order to maintain insurance cover. 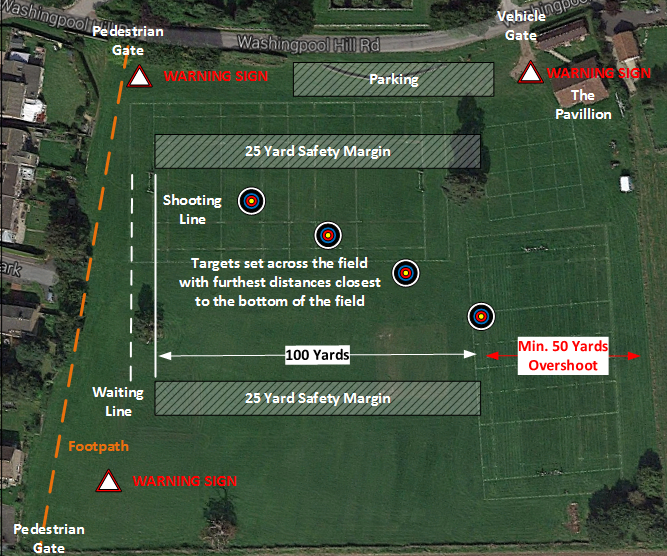 An alternative field layout is used during the monthly have-a-go sessions and the beginners’ course, this allows us to operate two shooting lines on two different whistles. All shooters attending have-a-go sessions or beginners’ courses must shoot from the non-members shooting line, all club members must shoot from the members shooting line. Each shooting line will be run by a different Field Captain, it is not acceptable to have a single Field Captain running both shooting lines. 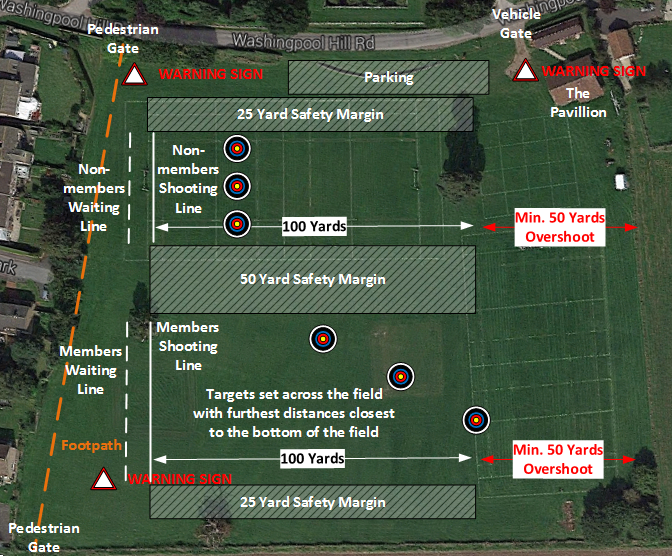 The Shooting Line should be at right angles to the road, at the far end of the school ground; those shooting short distances should be nearest the road, those shooting long distances should be closest to the fields. The Waiting Line should be 5yds behind the shooting line. An overshoot distance of at least 50yds behind the targets must be allowed for. Please set out warning notices and flags by the top and bottom gates as marked on the map above. The signs must be easily visible to any person or vehicle entering the field through the marked gates. There is a public footpath across the back of the school ground, keep an eye open for ramblers, dog walkers etc. Although the school ground is private it tends to be used by local children, so look out for them. Keep an eye out for animals on the field. Ensure that all targets and stands are properly pegged down. Always appoint a Field Captain (someone in charge of the whistle) for each shooting line. REMEMBER: EVERYONE AT AN ARCHERY SESSION IS RESPONSIBLE FOR SAFETY. DON’T LEAVE IT TO SOMEONE ELSE!!! Please note that recent changes to the Rules of Shooting (introduced in May 1994 to satisfy our insurers) require that all shooting must be from a common shooting line; and that if two groups of archers are using the ground at the same time (e.g. beginners having lessons and experienced archers shooting a round), then they should be separated by at least 50 yards. The insurers also insist that where the public have access to a shooting ground (even though not as of right), it will no longer insure an adult archer shooting on their own: they must be accompanied by someone else, who need not be affiliated, but who must be an adult. Also before starting a beginners’ session: all equipment should be checked including bows, strings, arrows, nocks, fletchings etc., Any damaged equipment should not be used and should be put on one side for the attention of the Club Captain; all beginners should be appropriately dressed – loose clothing must be avoided, as should jewelry; long hair should be tied back; all beginners must be shown how to brace and unbrace bows correctly and safely, and advised that if they cannot do it, they should ask a Club Member for help; all beginners must be told about the need to have long enough arrows; all beginners must know and understand about the use of the whistle and the meaning of the word “fast” in an emergency. Progress to the shooting line when told. Only commence shooting when told (or the whistle is blown once). When finished shooting, archers step back from the line to the waiting line so that the Field Captain can tell when the shooting line is clear. When not shooting, archers should stay behind the waiting line. Archers must not cross the shooting line unless and until the signal to do so is given. Beginners should be told how to react to the command “fast” and the relevant whistle signal (usually several blasts of the whistle). After Shooting walk, don’t run, to the target; watch out for arrows on the ground in front of the target. Take care to draw arrows correctly without twisting and bending; make sure no-one is standing behind you when you draw; equally, don’t stand behind someone drawing arrow. Arrows stuck in the ground should be pulled out backwards, not upwards, without bending the shaft, but if the fletchings are buried in the grass, it may be necessary to pull the arrow forwards (again, without bending), to avoid damage to the fletchings. Everyone should help look for missing arrows – there is a metal detector in the hut; all missing arrows MUST be accounted for – if an arrow can’t be found, it must be reported to the Club Committee and noted in the minute book in accordance with the terms of the GNAS insurance scheme. In addition, we would ask that any missing arrow be recorded in the attendance book kept just inside the hut door, together with an indication of its likely whereabouts in the field.